Trains and buses provide cheap transportation for a day trip from Munich to the Schloss Neuschwanstein Castle in the Bavaria Alps in Germany. Tour buses offer good deals too. Public transportation to Schloss Neuschwanstein and Schloss Hohenschwangau castles in the small town Schwangau is easy and relatively cheap by train or tour bus. These romantic, medieval-look castles are very popular day trip destinations from Munich (München). 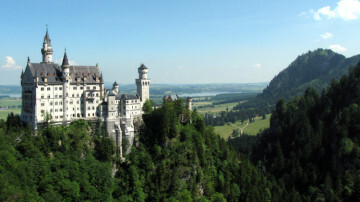 As a result, many bus tours are available as well from Munich to visit the Disney-like fantasy castle of Mad King Ludwig II of Bavaria. Trains run frequently from Munich (and Augsburg) to Füssen from where it is a short bus ride to Schwangau and the castles. Day-trip tour buses go directly to the castles and often include other popular sights such the Wieskirche, Ettal, Oberammmergau, and Schloss Linderhof Palace into the day-trip itinerary. Trains do not run all the way to the small village Schwangau where Schloss Neuschwanstein and Schloss Hohenschwangau are situated. However, frequent trains go to nearby Füssen from where it is a short bus ride to Schwangau. From Munich to Füssen takes just over two hours by train. Direct trains are available but in many cases an easy transfer is required, usually at Buchloe or Kaufbeuren – total journey time does not increase and the train fare is the same. Trains for Füssen departs from depart from Munich Main Station (München Hauptbahnhof) from Platforms 27 – 35. These platforms are at the far north end of the station – go to the far right when facing the trains. The trains will be either a Regional Express (RE) operated by Deutsche Bahn or a Bayerische Regionalbahn (BRB) train – the same tickets are valid. Travelers from the north and western parts of Germany should usually change trains in Augsburg. At least hourly trains run from Augsburg to Füssen. As with trains from Munich, some trains are direct while others require a transfer at Buchloe. Travel time in either case is just less than two hours from Augsburg to Füssen. Check public transportation schedules and buy train tickets online from German Railways: Munich-Hohenschwangau, Schwangau. Use Hohenschwangau, Schwangau (Schlösser) or Hohenschwangau Neuschwanstein Castles, Schwangau – easiest to copy and paste – as the destination bus stop closest to the castles and ticket office. Tick “only local transport” if planning to use a Bavaria Ticket – see below. Avoid journeys requiring more than one train change, or taking more than three hours. For transportation from outside Germany, try Trainline for trains and buses to Füssen (and then by local bus or taxi on to Schwangau). Füssen may also be written Fuessen – Fussen is grammatically incorrect (and pronounced differently). Buses run regularly from Füssen train station to Schwangau and are timed to depart shortly after trains have arrived. From Füssen, use bus 73 (direction Steingaden / Garmisch-Partenkrichen) or bus 78 (direction Schwangau) and exit at stop Hohenschwangau – Alpseestraße. These buses are generally marked Königschlösser (Royal Castles). Tickets are available from the bus driver, or included in the Bayern Ticket (but not in normal train tickets or the Allgäu-Schwaben Ticket). From Füssen train station to Schwangau is only 5-km (3-mile). Walking is an option while taxis will take less than 10 minutes from the station to the castles ticket office in Schwangau town. Book guided tours to the castles on GetYourGuide. Only regional trains run to Füssen – thus most railway passengers can save on their train journey when visiting Schloss Neuschwanstein and Schloss Hohenschwangau castles by using a Bayern-Ticket. The Bayern-Ticket allows for huge saving when traveling on regional trains in German states.. The Bayern Ticket is valid on regional trains and virtually all bus services in Bavaria from 9 am (midnight on weekends) to 3 am the following day. It may be used on the bus from Füssen to Schwangau as well as all buses, trams, and U-Bahn trains in Munich and Augsburg. Regional trains have the prefixes IRE, RE, RB, or S in the train name / number. Excluded are ICE, IC, EC, and IR trains. The Bayern Ticket can be bought for an individual traveler or for groups up to 5 traveling together. The price is determined by the number of travelers: it is €25 for one and add €7 for every additional traveler up to a maximum of €53 for five. Names of ticket users must be entered in ink on the ticket prior to the journey’s commencement. The Bayern Ticket is a superb savings deal. On the Munich-Füssen-Schwangau return journey the ticket for individuals pays for itself before the bus arrives in Schwangau and for groups long before the train pulls into Füssen station. The saving will be even bigger if the ticket is already used on Munich city transport too. A problem with the Bayern Ticket is that it is only valid on weekdays for travel after 9 am (weekends all day). If taking the 8:53 train from Munich, buy a ticket to the first departure station after 9:00 – in this case München-Passing. If traveling earlier in the morning, the Bayern Ticket may still be a cheaper option for the return journey. The Bayern Ticket is cheapest when bought from vending machines or online (DB English site) or Bayern Ticket (direct link for buying the ticket in German). Train tickets bought at station ticket counter windows incur a service charge – currently €2 per Bayern Ticket. See Using the Bayern Ticket to Save on Trains and Buses in Bavaria for more details and the fine print. The fantasy castles in Schwangau are easily reached by car. The driving distances are just over 100 km (60 miles) from either Munich or Augsburg. The fastest way is on Autobahn A7, which terminates at Füssen. Numerous more pleasant country lanes are also available with great scenery of the Bavarian Alps. Large parking lots (parking fees charged) are available in Schwangau near the castle ticket office. 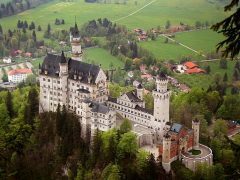 Driving to Schloss Neuschwanstein has the advantage that travelers can easily see more interesting sights nearby such as the UNESCO World Cultural Heritage listed Wieskirche, Kloster Ettal, Oberammergau, and Schloss Linderhof Palace. On a bus trip, tickets for the fantasy castles need not be reserved in advance. However, double check to see if admission to the castles are included. Admission is often extra and it is necessary to indicate at time of purchase (or sometimes when boarding the bus in Munich) whether a visit to the castle interiors are planned. In such case, the tour operator will arrange the ticket reservations. The tour bus goes directly to Schloss Neuschwanstein, the Disney-like castle most visitors come to see. The castles are only seen on a guided tour so arriving with a group or forming up in the castle courtyard makes little difference but note that not all tours include admission. En route from Munich, bus tours can add other sights such as the Wieskirche, Ettal, Oberammergau, and Schloss Linderhof . Seeing these sighs are very difficult to do on the same day when using buses and trains but is included on some tours from Munich..
Offers for tour bus excursions to Schloss Neuschwanstein differ widely so shop around and compare prices and deals. Admission tickets are often NOT included in the advertised prices. Füssen is the final stop of the Romantic Road (Romantische Straße) holiday theme route. In summer, it is also possible to travel to Füssen and Schwangau on the Europabus that runs along much of the Romantic Road on its journey from and to Frankfurt via Munich and Rothenburg ob der Tauber amongst others. See also Schloss Neuschwanstein Castle for more information on visiting the famous Disney-like castle built by Mad King Ludwig. More great photos of Schwangau and the fantasy castles at flickr.